By Krista AllenAfter a weeklong gathering for fun and games, the Tólikan community ended their festivities Dec. 3 with a visit from Navajo Santa of Ya'at'eeh Keshmish, a nonprofit organization. "What it is is to provide a good Christmas for as many people of the Navajo Nation as we can," Ya'at'eeh Keshmish supporter Gary Evershed, from Salt Lake City, said. "We try to provide things that are useful like buckets, shovels, clothes, axes, books, and toys for the children." Navajo Santa commemorated its 27th consecutive giveaway this year with volunteers from northern Utah including Jerry Sloan and Phil Johnson, two former Utah Jazz coaches. "(The giveaways) were held on the Utah portion of the Navajo Nation," former Navajo Nation Council Delegate Woody Lee said. "This is the first year that one of the founders has their license to do this in the state of Arizona, so it's here. "Comment: For more on the subject, see Santa Visits Havasupai by Helicopter. 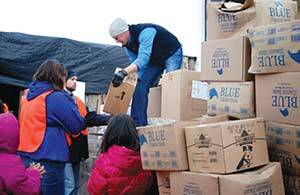 Below: "Volunteers from northeastern Utah unload boxes Dec. 3 at the 27th Navajo Santa Giveaway south of the Red Mesa Trading Post. Blankets, food, winter garments, and other necessities were given out."